A while back, I bought this 50-movie set, Sci-Fi Invasion, for five bucks. That adds up to ten cents per movie. The packaging calls this 1978 movie Alien Prey, but the menu and opening credits just call it Prey. It’s not what you’d expect. Here’s what happens: A murderous alien lands way out in the remote English countryside and starts eating people. 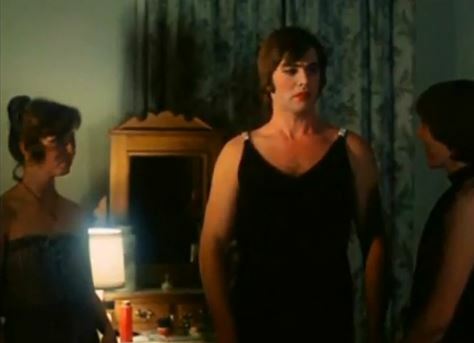 Disguised as a human, it ends up staying as a houseguest of two women who are, shall we say, intimate with one another. Cue the love triangle! Speculative spectacle: Although sci-fi on paper, this is a vampire flick in tone. Most of the movie takes place in this big, gothic mansion, and our alien bares vampy fangs as he kills random folks who come calling. Sleaze factor: You want girl/girl lovin’? This movie’s totally got girl/girl lovin’. What the felgercarb? The two ladies throw a party at one point, where they dress the alien in full-on drag because, well, because that’s the type of movie this is. Microcosmic minutiae: Talk about guerrilla filmmaking – the whole thing was made in only 10 days with hand-held cameras. 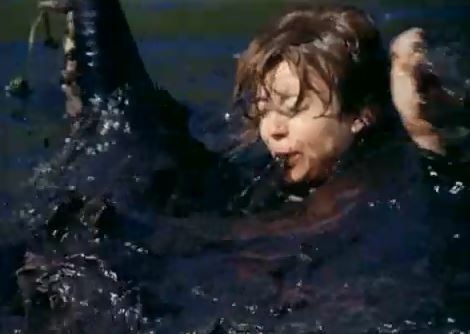 The actors wore their own clothes, and had to take injections after a scene where they swim in a nearby lake (and, yeah, that water looks nasty).